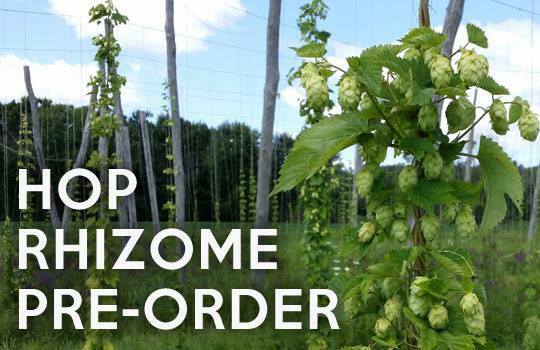 2019 Hop Rhizome Pre-Ordering starts now! Pre-orders will run through February 28th and will ship mid-late April. Each year we order extra rhizomes for sale and those will be made available on a first-come, first serve basis once all pre-orders have shipped. These varieties have been hand-selected for their ability to thrive in the Michigan / Midwest growing zones. The Hop Rhizomes we receive are healthy and many have hop shoots already growing. Growing your own hops at home is easy and rewarding. These rhizomes come from some of the best hop-growing farms in the Yakima Valley, which supply 70-75% of all hops grown in the U.S. You can be assured that you are buying quality rhizomes. Rhizomes should be planted immediately for best results. If your area is still experiencing frost then plant them indoors until it is safe to transplant them outside. The first year's crop will generally be smaller than subsequent years. Since these are live plants, we cannot guarantee they will grow, so we recommend buying two of each type to help ensure their success. However, hops are pretty hard to kill and we've included a How to Grow Hops guide on our Hop Rhizomes page.